"Um, Acha? There's an enormous f***ing rat behind you..."
I decided to feature Miss Gianni today because of a plurk that she'd made. In this plurk, she expressed her annoyance at shallow-minded people who gave her "advice" about her avatar. You know, LOOK MORE NORMAL. Why? I'm still not sure why we're holding to the idea of human representation at all, given the vast license for creativity that our fake world affords. Gianni is gorgeous in her own way, but most so because she expresses some creativity instead of defaulting to the bland, bland, bland norm. Go Gianni go! Poor Rogan Diesel. Sends me poses, like the cute girlfriend poses from last week, and I end up genderbending them. 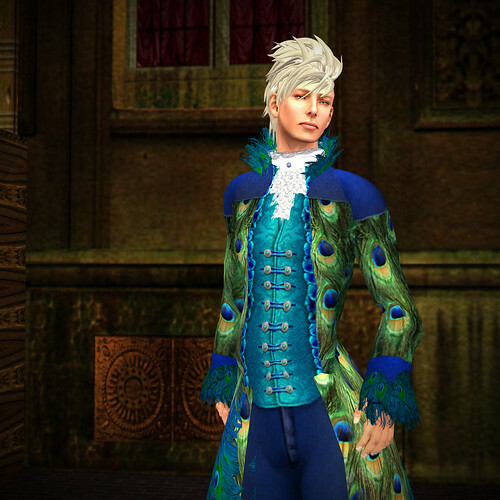 A little while ago I was sent a new set of lovely male AO poses…and *cough* doesn't Acha look fetching in them? She's wearing an 80s power suit of sorts with this beautifully textured (Elate!) belted miniskirt and new pick reward vest from ~silentsparrow~. I highly recommend putting that sim in your picks, hyasynth's pick rewards are usually well worth gathering up. This packet of waistcoats comes in two layers and five-ish? colors. (I forget.) Now I'm off to the park with my kid! Yay Sundays. ***Waistcoat: ~silentsparrow~ Blodeuwedd waistcoat in chocolate, picks reward! ***Poses: Diesel Works Alagan, click to see how they should look, lol.